The 'wet process' developed by William Henderson and others was successfully used during the late twentieth century and in a modified form in the early twentieth century. This is described in more detail in the page concerning processing in those periods. This page describes a simple and safe experiment that can be done at home to extract copper from the Alderley ore. In each section, the left hand column gives instructions, the centre useful pictures and the right hand column provides some scientific or other background material. Some copper ore. You should ask the National Trust for permission to collect some small pieces from somewhere on the Edge. A suitable place is on Stormy Point. On no account should you chip rock away from a solid face as this could be dangerous and also illegal. The DCC will discuss with the National Trust the possibility of preparing small samples which can be collected from the museum. 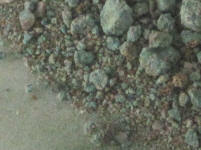 The Alderley ore is sandstone (silicon oxide: SiO2 containing the ores of copper between the grains. 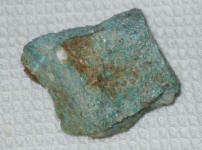 The copper ore is mostly malachite (copper carbonate: CuCO3.Cu(OH)2) and azurite (hydrous copper carbonate: 2CuCO3.Cu(OH)2). White or spirit vinegar is a solution of acetic acid in water. 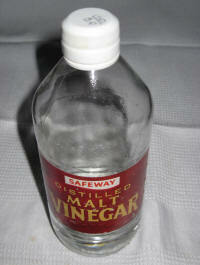 Shop-bought vinegar is typically 5 to 8% acetic acid. Its pH is about 3 making it a weak acid. Acetic acid has the formula CH3COOH and it is readily found in nature, usually as an oxidation breakdown product from other more complex chemicals. Its use here is ideal as it is an acid, readily available and weak. An iron nail ore some scrap iron pieces. Six inch nails are ideal. 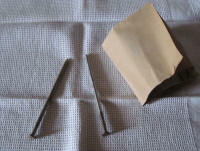 You will also need some sandpaper as the nail needs to be very clean. In this picture, the nail on the right has been carefully cleaned with the sandpaper. Iron is a metallic element, Fe, which is reasonably stable but can be easily oxidised into iron oxides (rust) in the presence of air and water. Iron is usually alloyed with small amounts of other metals to improve its fitness for purpose. Containers. Test tubes are ideal. I borrowed these from my wife who was given them some time ago as a flower holder! Small glass jars are just as good. You only need two and can get away with just one. 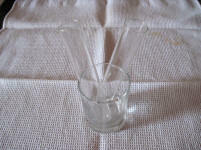 Glass test tubes and jars are ideal as they do not discolour or get scratched easily. This makes observations of the reaction in the tube or jar much easier. Somewhere to work safely. You need a space where you can crush the rock, fill and shake the test tubes or jars, prepare the nails, and generally do the experiment without getting in anyone's way. You also might want some basic safety kit although the risk is no greater than putting some vinegar on your chips and then eating them with your fingers. If you want to be really safe, wear an apron, use goggles or safety glasses and gloves. Young chemists at an Alderley Edge open day. Allow about an hour to carry out the experiment. The longer you allow yourself, the better the results you will get. Crush the copper ore. 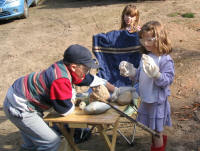 Wearing the goggles to protect your eyes (and keeping other people a safe distance away), crush the sandstone between to heavy metal objects such as two large hammers. Collect the sand carefully trying to avoid mixing in any other debris. The pieces should be less than 5 mm across. In the industrial process in the nineteenth century, the ore was crushed between rollers to produce a sand which would pass through a half-inch (12 mm) mesh. Fill the first tube or jar. 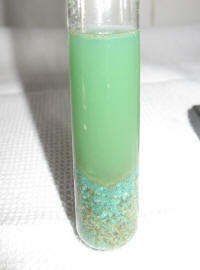 Put the crushed ore into a jar or test-tube, filling about a quarter of the volume. 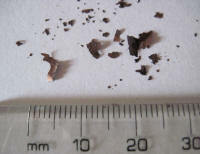 In the pictures shown about 20 g of crushed rock was used. The piece in the first picture is no more than 50 g.
Instead of glass jars, the industrial process used wooden and slate walled vats. Add about three times the quantity of vinegar. The vinegar should cover the sand and go a fair way further up the container. Roughly, 3 times as much vinegar will be required by weight to get reasonable results (60 g of vinegar added to 20 g of ore). Shake the container well to mix the vinegar and sand. At the mine, the acid was pumped around and allowed to trickle down through the sand. The acid was muriatic acid (hydrochloric acid) and was very much stronger than household vinegar. Leave the mixture to settle. 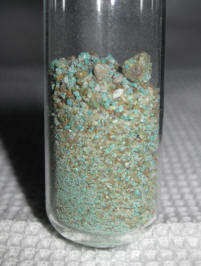 The sand and copper solution will separate out quite quickly leaving a nice clean blue upper layer. This contains copper acetate. 2Cu(CH3COO)2 + CO2 + 2H2O. Although carbon dioxide is given off, the amount is quite small and hardly visible. 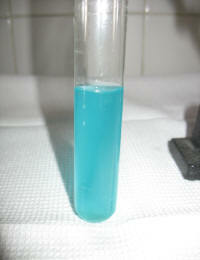 Copper acetate, like a lot of other copper compounds, is blue. Separate the solution into a clean tube. Try not to get any sand in the clean tube. This was, it is easier to see how much copper has been made. In the industrial process in the nineteenth century, the blue copper chloride solution was pumped into another set of tanks. Put in the nail that you have cleaned earlier. 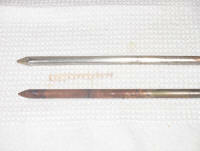 The iron in the nail dissolves into the solution and the copper is separated (precipitated) out. Leave the nail for a while to get as much copper as possible out of the solution. The process taking place is a form of electrolysis. Iron metal would prefer to lose two electrons and become an Fe++ ion while copper prefers to gain electrons and go from Cu++ to copper metal. This process is driven by the difference in Eo, the electropotential, of the metals. Eo of copper Cu++ is +0.19 V whereas that of iron Fe++ is -0.44 V. It is the difference between these values that drives iron to replace copper in the solution. After a while, take out the nail. If you got everything right before, the nail should now be coated with a pinkish or brownish layer of copper. The copper can be scraped off and the process will start again. If the copper is not removed, it will 'plate' the iron and stop the reaction. The upper nail in the picture has not been in the blue solution. At the mine, the process was carried out in vats and periodically the vats were emptied when most of the iron had dissolved. The waste, iron chloride, was disposed of somewhere on the site - we don't know exactly where! Finally, scrape remaining copper off the nail. 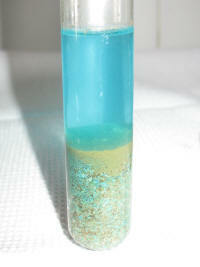 There may be some copper in your test tube or jar as well. Collect it in one container, rinse it gently under water and then have a look at the pieces you have made and collected. The copper metal was about 60% to 80% pure when it was sold from the Alderley Edge mines to smelters in St Helens and the Liverpool area. Last but not least, clean up! The vinegar can safely be poured down the drain. It is probably wiser to separate the remaining sand, wrap it in paper or a plastic bag and put it in the waste bin. Wash out the vessels and recycle any glass jars. It is worth keeping a little sample of the copper ore and the copper to show your friends or teacher. I hope you have been successful in making some Alderley Edge copper. In the period from 1857 to 1877, about 3500 tons of copper were made and sold in this way. You have probably produced about 1 g. Only another 3499.999999 tons to go.